“Go to the guys on Broadway.” It was the hands down answer as to where I should get my hair cut. I was told that not only do they cut the hair for most of the guys in the neighborhood but the endless bantering between the brothers is pure entertainment. And indeed it is. Father and Son Barber Shop – It’s kind of like the all-male version of Moonstruck. Their shop at 5806 North Broadway is a clean, simple and modern facility. Four seats across, a couple flat screen TV’s and a waiting area with a few stacks of magazines. Whether you’re waiting or actually in the chair, plan to be engaged in conversation. Even if they’ve never seen you before, you’re going to get pulled into the conversation. Joe’s chair is the nearest to the window. He’s the father of the operation that started out under the Thorndale L stop in 1967. He’s been cutting hair in the Edgewater neighborhood ever since. In 2006 the shop moved to North Broadway. I asked if their father made them go to barber school. “No”, Pete said. “I was in college, if you want to call six months being ‘in’. But I found myself distracted. It was my mom that suggested I do something else. My dad had done pretty well and he was the only guy in the shop, so I decided to join him after I graduated from beauty school. That was almost twenty years ago”. He went on to tell me that his brother Anthony had been a banker before he became a barber. “He saw things kind of tightening up – he wasn’t able to help his customers the way he felt he should have been able to. Anthony joined us about eight years ago”. Despite looking as though they’re twins, Pete and Anthony are two years apart. “Everyone asks”, Pete told me. Fit, olive complected, dark-eyed, thick-haired Italians, both sport white toothy grins and both of whom arch their neck backwards when laughing out loud – something that’s quite common in their establishment. Nino could easily pass as their younger brother. He’s a friend of the family that joined the shop not long after Anthony. But he may as well be because the three of them carry on as though they grew up in the same house together. On my recent visit Nino was trying to convince a little boy that his haircut would be easy and painless. He placed the vibrating body of the electric clippers against his shoulder. “See. It’s going to feel just like that and that doesn’t hurt does it”. I remembered hearing that line when I was a kid. Everyone in the shop smiled as the young boy continued resisting the inevitable. We all must have heard that line. Their customers slice through the local demographics – young, old, men, women, straight, gay, Cubs, Sox, hipsters and professionals. You can expect the conversations taking place in there to slice through the same topics – or not. It’s possible everyone there might just get caught up in the current game on The Price is Right. “She’s only got two of those numbers right – and those are the two that can’t be changed,” says one brother sarcastically. Had I known that this event was taking place I would have planned around it. But like most of the great social interactions that occur, planning couldn’t have produced a better experience. The topic was what Chicago is going to be in 2109 – on the 200th anniversary of Daniel Burnham’s plan for the city. It was a discussion group hosted by the Chicago Humanities Festival at the Harold Washington Library. I took a special interest in today’s discussion because John Tolva was on the panel. John and I met for lunch a few weeks ago to not only to meet after following one another on Twitter, but also to revel in each other’s passion for the city – the urban environment. The other panelists were Doug Farr, an architect and planner and Cheryle Jackson, former president of the Chicago Urban League and current candidate for the US Senate seat vacated by President Obama. Each panelist had time to display their ideas of the future of Chicago. Doug Farr discussed LEED certifications and highlighted specific projects. He talked about zoning and cheekily encouraged city engineers to quietly exchange “minimums and maximums” – citing parking and square foot regulations. He also discussed the increased levels of obesity among Americans as an indication that our current built environment is putting us in harms way. John Tolva talked about the ‘city as a platform” for problem solving. He suggested that the data available on any street corner – mobile phone transmissions, Wi-Fi connections, text messages, Tweets, GPS connections, CTA card swipes, pedometers in shoes and the like have the potential to demonstrate patterns if that data can be collected for statistical purposes. Then through the statistical modeling patterns can be encouraged or modified based upon social or monetary incentives, for example. John likes to examine movement through cities. Cheryle Jackson discussed social and economic segregation. She spoke of the challenges facing residents of Chicago’s south side, such the absence of adequate public transportation, the absence of adequate grocery options, but pointed to solutions such as farmer’s markets that accept food stamps. She talked about reversing the trends that show that more African-American men in Chicago will go to prison than to college. The second half of the presentation allowed for questions from the audience. Almost all of the questions had something to do with transportation – and specifically, how Chicagoans will move themselves through and increasingly dense urban environment. Doug Farr envisions completely walkable neighborhoods where residents are just a few blocks away from the things that they need. John Tolva looks towards an increase in public transit coupled with bicycle accessibility. An interesting point was made in that Chicago’s current transportation networks are based primarily upon post-war (WW2) models. The fact is that very few, if any American cities have evolved past that post-war model. As a former VP at Amtrak Cheryle Jackson fielded questions about high-speed rail and discussed the costs and losses attributed to the political clout of the highway lobbyists. She discussed how the privatized Chicago street parking has effected people in her neighborhood and how that has shed light on other problems as well as placing an emphasis on solutions. As always, its a treat to be surrounded by so many people who care so deeply about their city – the 385 seat auditorium was sold out in advance. And even nicer to see planners, visionaries and politicians working together to create solutions, not to mention the fact that a senate candidate has the ability to talk about rail transit! A special thanks to the Chicago Humanities Festival for hosting this event. I had a moment to chat with Cheryle Jackson following the event – we spoke about the CTA and Amtrak and how I sometimes commute between Ohio and Chicago on the train. She encouraged me to head out east and ride the Acela. “If you like Amtrak, you’re going to love the Acela,” she said. If you’re curious as to why you deal with congested roadways every day, watch this video. If you’re curious as to why our public transit systems have failed, watch this video. If you’re curious as to why governments fund freeway systems rather than public transit systems, watch this video. It’s possible to watch the entire video here, Taken For a Ride. A Columbus resident sent me the link to this film earlier today. Entitled “Taken For a Ride”, produced in 1996 by New Day Films, this documentary looks at how (and why) General Motors dismantled various public transit systems and began replacing them with their own vehicles. The saying was, “What’s good for GM is good for America”. I find it unfortunate that the Federal money spent on bailing out General Motors wasn’t earmarked in such a way that required them to rebuild what they had destroyed. Rebuilding cities’ public transit systems could likely keep GM facilities running for decades to come. When I checked in at the Cleveland station the Amtrak attendant asked if I was familiar with the Metropolitan Lounge at Chicago’s Union Station. I told him that I was (although I’d never been in). “Good”, he said. 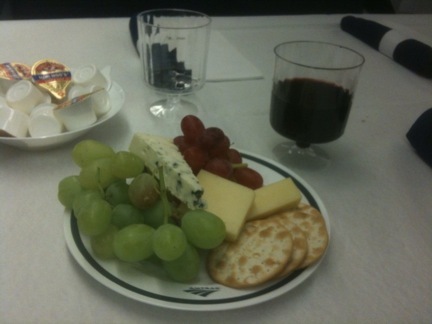 “If you can arrive early there is a wine and cheese reception for our sleeper-car passengers. It’s quite nice, so do your best to get there early”. I arrived at Union Station at 7:30p and entered the lounge. Not unlike an airline club room, the Metropolitan Lounge is outfitted with numerous groupings of sofas and chairs as well as several tables. A variety of hot and cold drinks are available at no additional cost as are light snacks. The lounge also has complimentary Wi-Fi service. At 8p those of us booked on the 48/448 Lake Shore Limited were invited to board the train. We were escorted onto the platform, then to our appropriate car. This time my attendant was Mike. Not as pressed and proper as my previous attendant, but just as nice. He suggested I leave my things in my room and head to the dining car for the reception. The dining car tables had been lined with white tablecloths and set with blue cloth napkins. There I was met by a impeccably groomed staff who offered a choice of wines, Shiraz or Chardonnay. Moments later an assortment of cheese and crackers were offered. There was never any need to ask for another glass of wine – each time the gentleman passed he filled the glass. A woman joined me. She was about my age and traveling from San Antonio to Pittsburgh, stating that she was meeting her husband who preferred to fly. She told me that she takes the train whenever possible. “This is an entire community on wheels”, she explained. “We’re in here watching the world go by with no cares and no worries”, she said. “And the people that watch us pass by have no idea about the world inside of this train”. She continued by telling me that she’d always lived near a rail line and enjoyed the sound and sight of passing trains. When I lived in Salt Lake City the sounds of passing trains just a block away would lull me to sleep. Mike prepared my room and turned in for the night ride back to Cleveland. While I dozed off for a couple of hours here and there, the fact is that even at night, I was intrigued by the landscape and I often propped myself up to gaze out the window. Through rural Indiana and Ohio, passing through so many small communities, one can see that there are lives taking place right along the tracks. The stop at the Toledo train station always reminds me of an Edward Hopper painting. When I was young our neighbor across the alley was a model railroader. Half of his basement was devoted to miniature landscapes through which his N-gauge railroad traveled. It felt as if I were inside that model railroad looking out at the landscape that was so meticulously created. Even during the night and even during the rain – I was captivated by what is just outside the window. Including the tank of gas to and from Cleveland, my travel costs amounted to $380 round trip. That’s a $226 savings over a comparably purchased time-sensitive airline ticket. And for the $226 savings, I received sleeping accommodations, personal attention, a full breakfast (en-route to Chicago) as well as a well-planned social prior to departing Chicago. There were no lines, no security hassles, no stressed out passengers and plenty of space to stretch out or go for a walk and free parking at the Cleveland Amtrak station. I’ll say it again – there is no more civilized form of transportation than that of travel by train.